Human infection with diverse echinococcal species is termed as hydatid disease. It has a worldwide distribution and was documented in India as well. It is acquired by the ingestion of eggs or gravid proglottids excreted from the definitive host or from eggs contained in faeces or plants contaminated with eggs or soil followed by direct hand to mouth transfer. The larvae released from the eggs penetrate the gut wall, enter the bloodstream, and disseminate to the deeper organs. The mainstream of the cysts is found in the liver, but others are found in lungs, bones, and brain, and only in about 2% of cases, the oral and maxillofacial region is affected. 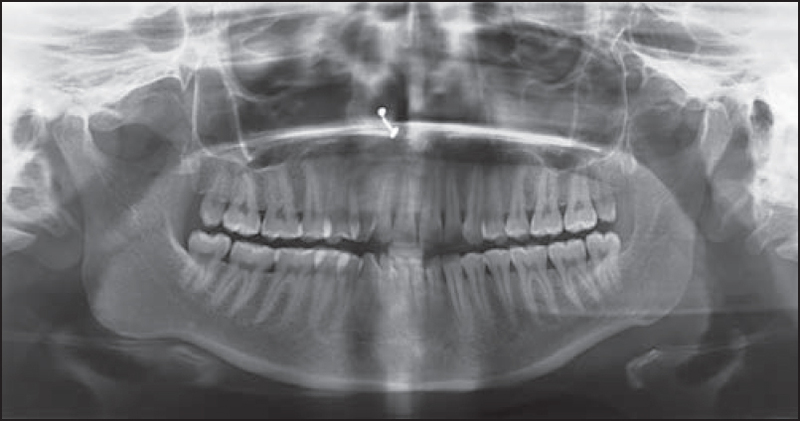 The present case reveals a rare case of intraoral hydatid cyst in a 20-year-old female patient. A 20-year-old female presented with a small swelling at the right side of the cheek region intraorally for the past 5 days. Her history of presenting illness revealed that it was gradual in onset and had increased and attained the present size. There was an associated low-grade, intermittent fever 2 days before she visited the hospital and was not associated with pain or difficulty while chewing or during other functional activities. There was no abnormality detected on extraoral examination. Intraoral examination revealed the mucosal surface was absolutely normal bilaterally and upon palpation, a localized swelling was noticed in the right side buccal mucosa against 46, 47, 48 region at the occlusal level, which was measuring approximately 1 × 1 cm in size, roughly ovoid in shape with slightly rough surface texture, well circumscribed, nontender, and firm in consistency. The mass was freely movable in relation to the overlying mucosa, but was fixed to the masseter muscle anteriorly [Figure 1] and [Figure 2]. There was no change in size of the mass while opening or closing the mouth and no spasm of the masseter muscle was observed. The examination of parotid gland and duct on the respective side was found to be normal with adequate salivary flow. Based on history and clinical examination, a provisional diagnosis of calcified buccal lymph node on the right side was made. Differential diagnoses of intramuscular calcification, rhabdomyoma, and solitary neurofibroma were considered. Panoramic radiography (OPG) was advised which revealed no abnormality [Figure 3]. 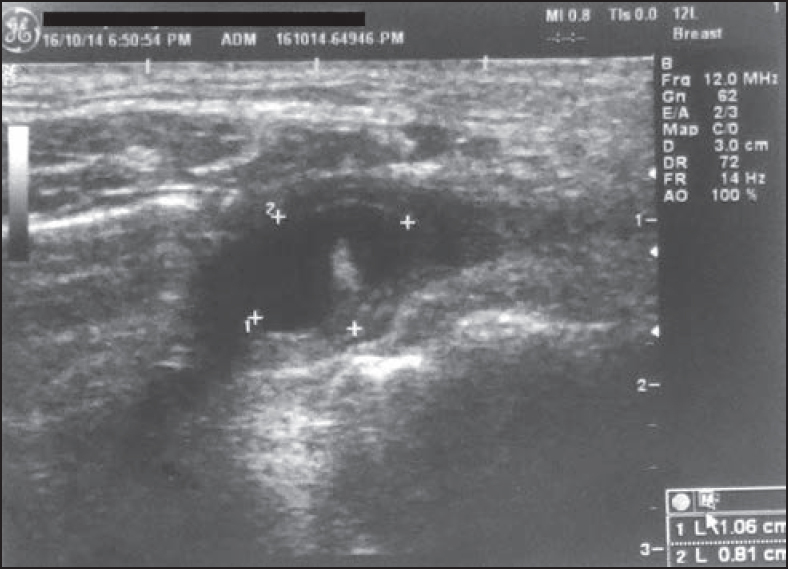 Ultrasonography (USG) of the right-sided cheek region revealed a thick-walled cystic lesion (1 × 0.8 cm) with hyperechoic mural focus deep to right masseter muscle at the level of angle of the mandible [Figure 4] and fine needle aspiration cytology (FNAC) findings were suggestive of inflammatory lesion. 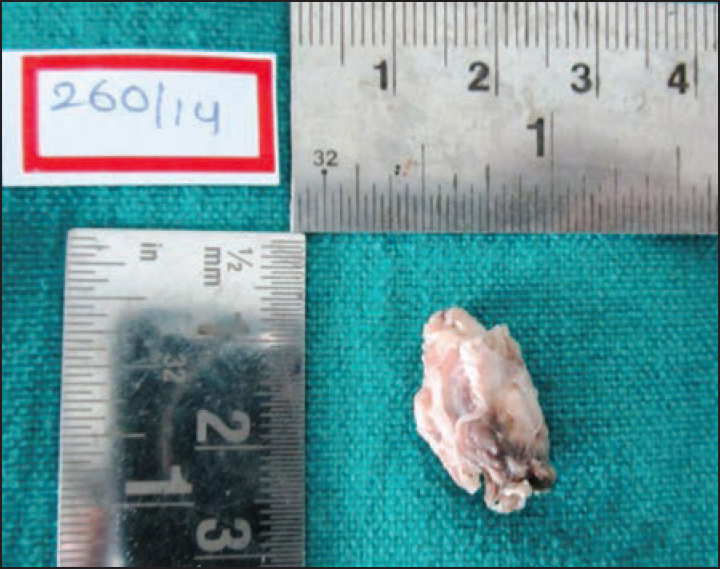 Complete surgical excision was done [Figure 5] and the specimen was sent for histopathology. Histopathological findings confirmed it as hydatid cyst. Histopathological findings showed brood capsules originating as minute projections from the germinative layer. The parasite within the capsule was surrounded by three layers: Outer layer, intermediate layer, and inner layer. The outer layer consisted of fibrocellular connective tissue capsule with chronic inflammatory cell infiltrate containing chiefly lymphocytes and plasma cells. The intermediate layer showed white, non-nucleated, and numerous loosely arranged delicate laminations. 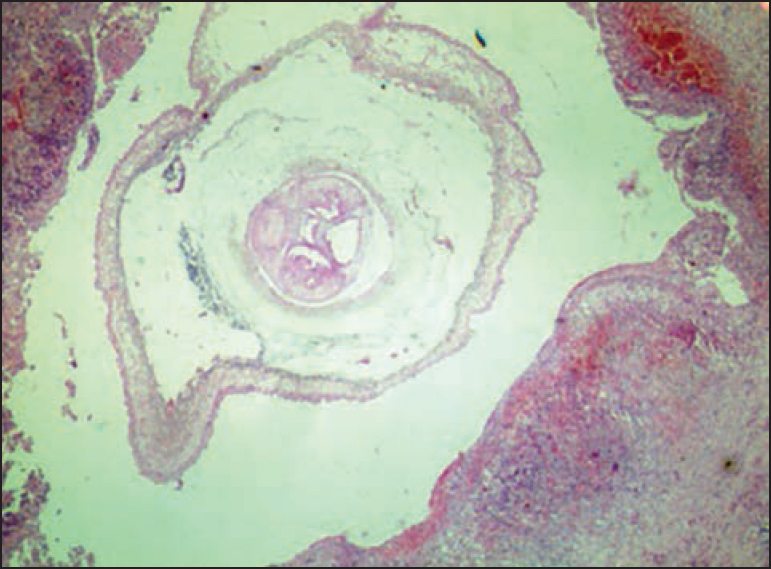 The innermost layer showed three brood capsules (daughter cysts), which was a nucleated layer and consisted of clear fluid [Figure 6]. Patient was under regular follow-up and no recurrence was noted. Echinococcosis is a parasitic infection occurring in humans and other animals like dogs, sheep, cattle, and fox. This parasitic disease is caused by cestodes of genus Echinococcus. It is found to occur mostly in the Mediterranean countries, South America, Australia, central parts of Asia, and East African countries. The parasitic infestations result in hydatid cyst, which is formed by the larval form E. granulosus. The life cycle of this parasite occurs in two hosts, wherein the adult tapeworms reside in the intestine of carnivores, i.e. dogs and foxes, which are the definitive hosts, and the larval forms reside in the intermediate hosts, i.e. man, sheep, cattle, etc. Humans acquire this disease if he/she accidentally ingests the ova passed in the stool of dog or the food contaminated by ova or by contact with the infected dogs. , The larva from the ova penetrates the intestinal mucosa and reaches the liver through the portal vein and develops into a cyst. Majority of the larvae affect the liver followed by lungs, abdominal cavity, kidneys, and bone. These cysts are very rarely positioned in the head and neck region  and few reported cases in literature showed site predilections like the right side submandibular region,  infratemporal region,  tongue,  and floor of the mouth. 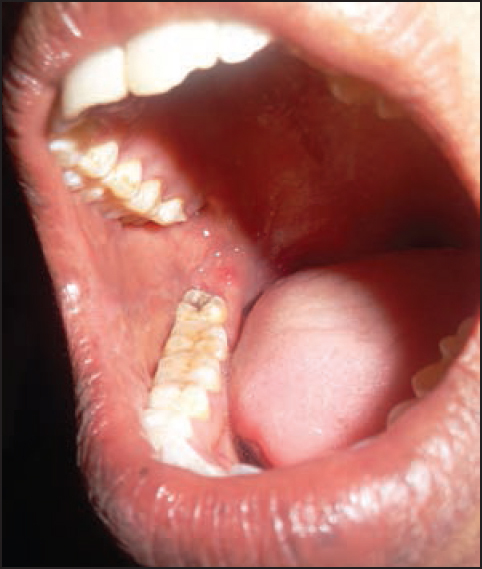 Unlike the reported cases in literature, in the present case the buccal mucosa was affected. The disease often starts without symptoms and this may last for a year. The signs and symptoms depend on the cyst's location and size. The diagnosis of this condition can be made by histopathology, various imaging techniques [USG, computed tomography (CT), and magnetic resonance imaging (MRI)], and serological tests and antigen assays. At present, CT and USG are the most precious imaging techniques early in the disease process and frequently reveal one or more simple appearing cysts of varying sizes that are surrounded by either a thin, well-circumscribed wall or, less often, by a slightly thickened irregular wall. USG is helpful, particularly in the early stages, when the lesion is cystic, in detecting daughter cysts, hydatid sand, and hydatid membranes. According to recently published reports, MRI can differentiate parasitic, nonparasitic, or traumatic cysts by demonstrating "low-signal intensity rim," the so-called rim sign, which has been described as characteristic of hydatidosis. Among the serological methods, immunoelectrophoresis has 90-95% sensitivity and it remains positive for 1 year after the organism has been eradicated; so it has a role in screening in endemic areas. The presence of an antigen specific for E. granulosus that appeared immunoelectrophoretically as a band of characteristic morphology and location when tested against sera from human patients has been reported. Surgical removal of cyst is the most common treatment, which was done in the present case, and it can be planned in a few cases in combination with chemotherapy. 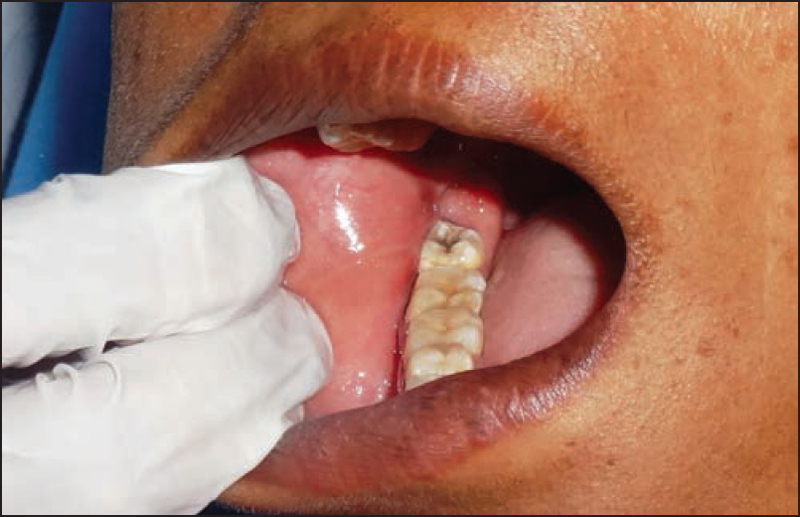 As intraoral hydatid cyst is a tremendously unusual condition and very few cases have been reported in literature, a high index of suspicion is desirable for diagnosing these cysts when they are situated in a strange location in order to arrive at a correct diagnosis and provide appropriate treatment. Wilkinson A, Mahore S, Chikhlikar K, Gohad G, Bothale K. Hydatid cysts presenting in uncommon sites - An uncommon case series. The Southeast Asian Journal of Case Report and Review 2014;3:645-56. Sultana N, Hashim TK, Jan SY, Khan Z, Malik T, Shah W. Primary cervical hydatid cyst: A rare occurrence. Diagn Pathol 2012;7:157. Rochidi Y, Raji A, Elhattab Y. A rare localization of hydatidosis: A cervical hydatid cyst. Fr ORL 2007;92:315-7. Khanna S, Mishra SP, Gupta D, Kumar S, Khanna AK, Gupta SK. Unusual presentation of hydatid cyst: A case report. Int J Res Applied Natural Social Sci 2013;1:25-8. Kirmani MA, Sajad M, Patigaroo AR, Khan AR. Hydatid cyst of tongue. JK Pract 2007;14:107. Berkiten G, Topaloglu I. Submandibular hydatid cyst fistulized into the oral cavity. B-ENT 2013;9:251-3. Umesh K, Sulabha AN, Sameer AC, Neelakant MW, Sangamesh NC, Ali RP. Hydatid cyst of infratemporal region - A rare case report. J Med Sci 2010;3:94-8. Nayar RC, Rajwanshi A, Menn SB, Arora MM. Hydatid cyst in the floor of the mouth. Indian J Otolaryngol 1982;34: 78-9. Rasheed K, Zargar SA, Telwani AA. Hydatid cyst of spleen: A diagnostic challenge. N Am J Med Sci 2013;5:10-20.